When Donald Trump won the 2016 presidential election, a bewildered nation turned to Strangers in Their Own Land to understand what Trump voters were thinking when they cast their ballots. Arlie Hochschild, one of the most influential sociologists of her generation, had spent the preceding five years immersed in the community around Lake Charles, Louisiana, a Tea Party stronghold. 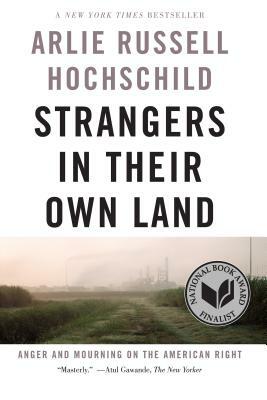 As Jedediah Purdy put it in the New Republic, "Hochschild is fascinated by how people make sense of their lives. . . . Her] attentive, detailed portraits . . . reveal a gulf between Hochchild's 'strangers in their own land' and a new elite." Already a favorite common read book in communities and on campuses across the country and called "humble and important" by David Brooks and "masterly" by Atul Gawande, Hochschild's book has been lauded by Noam Chomsky, New Orleans mayor Mitch Landrieu, and countless others. Every last Wednesday of the month our book club meets to discuss a book. Each month the selected title is 20% off for all, and everyone is welcome to attend the discussion.